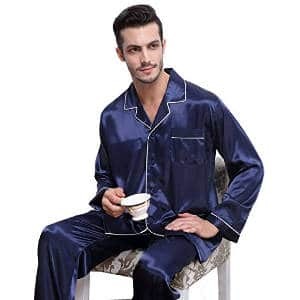 If you are looking for a special set of pajamas to offer as a gift to a man in your life or you are a man that wants to enjoy a special set of pajamas, then choosing one of the best silk and satin pajamas for men can really be a good option. In this review, we have selected all the top choices in lots of different colors and designs, so you won’t have any difficulty in finding one that will appeal to you the most. 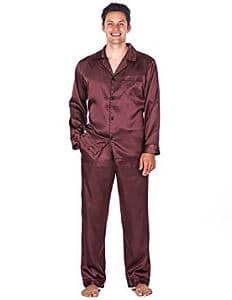 The Del Rossa men’s satin pajamas set is available in many colors and at a great price. It appears to be the most sold pajama set and gets some fantastic reviews. It is made of premium silk like satin fabric for a daily use. It´s a Full button front top with contrast piping and a chest pocket. The elastic on the waist is quite comfortable and has a button fly front. The fabric feels easy on the skin and is great for lounging around. This pajama is machine washable in cool water. The company accepts returns if you are not satisfied with your purchase. 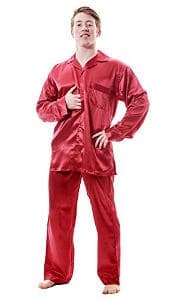 The Noble Mount men’s premium satin pajama sleepwear set comes in 4 colors and with different designs. It has a smooth satin outside and a brushed cotton inside to give you a little warmth. The sleeves are long with a collar, front pocket and contrasting trims. The waistband is elastic but also has a drawstring for required adjustment. The size is quite roomy for comfort and has a concealed button fly front as well as two side seam pockets. Users say that this feels like a good quality product when you wear it. The satin feels very soft and there is good firm stitching. 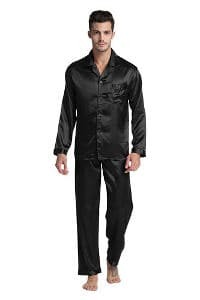 The Men’s Classic Silk Pajama Set (The Riviera) is truly a luxury sleepwear for men. It is made of 100% silk and is not a low price product. The silk is heavier giving it a real elegant and classy look. The Pants have a button fly front and elasticized waist with a drawstring closure. The shirt is button front and has long sleeves and a chest pocket. As it´s silk, it is recommended to wash it by hand, however the company says it is also machine washable and dry cleanable. This set can be a great gift for a man and can surely be appreciated. The Intimo men’s classic silk pajamas are made of 100% silk and are available in 4 colors. They are very well tailored giving this set a luxurious feel and look. These heavy gauge silk pajamas are smartly trimmed with discrete piping, a notch collar button front and two panel pockets. The pants have a drawstring and a fabric covered elastic waistband with a hidden fly button. They do not come with the side pockets. The Tony& Candice Men’s Pajama Set is made of good quality satin which gives a silky feel. It is well tailored and has a front pocket on the chest. You have a choice of 4 colors and you must refer to the size chart given instead of ordering the usual clothing size of S/M/L. It is recommended to wash these pajamas on a delicate cold water cycle in the washing machine and air dry them. The pants don´t have any side pockets, and the waistband is elastic without the drawstring. 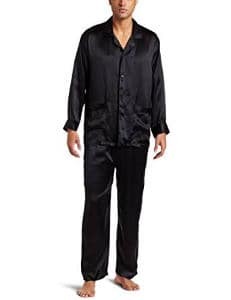 The Men’s satin pajamas set is made of good quality satin and looks quite elegant. It´s not silk but should give you that silky feel. The contrasting piping looks nice while the pants have a front fly and drawstring on the waistband. The sizes are generous and you can go up to size 4XL. However, you must check out the size chart before ordering. The number of reviews are not so many but those who bought it give it the maximum ratings. 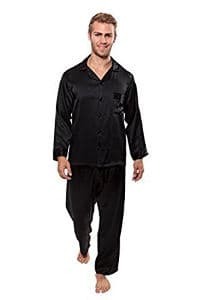 The Twin Boat men’s satin sleepwear/pajama Set is made of soft satin fabric. It comes in 3 colors and I like the stylish contrasting color of piping which doesn´t stand out so much. It has a 4 button down front and a chest pocket while the pants have an elastic waistband with drawstring. There are also side seam pockets which can be handy. Consumers share a very good feedback about this product stating that the pajamas look good quality and feel very comfortable. Some men have even gone for a second set in another color after trying out the first one. 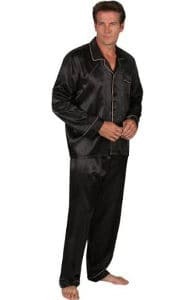 The Men’s Silk Satin Pajamas Set is great to sleep in and it looks very elegant for loungewear. The stripe design looks smart and the soft satin will stay close to your skin. It comes in US sizes so it is big enough and the available sizes are up to 4XL. The pants have a front fly and a drawstring on the waistband. It is available in 6 sizes and at the time of writing this review, the company was offering 50% discount. This set can be a great gift for your loved ones for the holiday season or any other occasion. This Men’s Pajama Sleepwear Set by TexereSilk is a luxury pajama set made of 100% Silk Jacquard. I am not sure how long the discount may last, but for now this set is available at a greatly reduced price. The Shirt features a button front, chest pocket, long sleeves, and an elegant trim along the collar and front. The PJ pants feature a button fly front and an elasticized waist with drawstring. It is recommended to hand wash the pajamas. It can be a great gift for any occasion to give the man that special look. 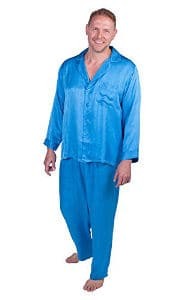 The Up2date Fashion Men’s Satin pajama is a simple and classic style PJ set. It is made of Poly Satin and the material is lightweight with a silky feel. The company offers a full refund if you are not happy with your purchase. The pants have a pocket in each side and in addition a breast pocket on the shirt. The waistband is elastic without a drawstring. The great majority of users really like it and state that it washes well, dries quickly and is wrinkle free. Overall, this is a great product for the price, which is highly discounted at the time of writing this review. 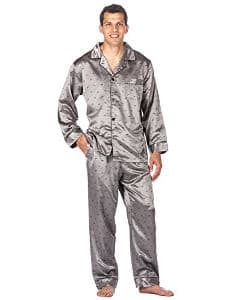 All in all, these are some of the best silk and satin pajamas for men we have selected to review and they can make a great gift for any special occasion.